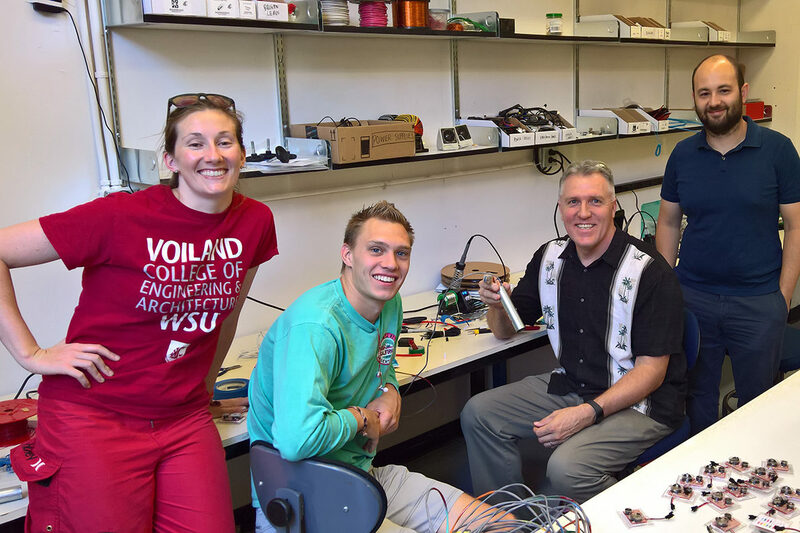 WSU device assembly team (l-r:) Sasha Richey, MME student Ian Laursen, Kirk Reinkens and Arda Gozen. PULLMAN, Wash. – Knowing how much you have of something that can’t be seen is a critical issue in the drought-prone state of Ceará in Northeast Brazil. Washington State University researcher Sasha Richey leads a project that will provide better measurement, monitoring and management of the groundwater in this region of Brazil. Traditional tools to assess the status of groundwater are cost-prohibitive for rural communities such as those in Ceará. Richey, an assistant professor in the Department of Civil and Environmental Engineering, has teamed up with fellow Cougs to develop a cost-effective alternative. Together with Arda Gozen, assistant professor in the School of Mechanical and Materials Engineering, Kirk Reinkens, director of the Frank Innovation Zone, and a group of engineering students, Richey’s team has created 120 inexpensive groundwater measuring tools for the communities of Ceará. The cost of each is under $20, built solely from components that can be purchased at any hardware store globally. Alicia Cooperman tests WSU designed groundwater measuring device in Brazil. Photo by Jaclyn Leaver. Each study community will participate in a training workshop starting later this month to learn how to use the devices and also to learn basics of groundwater sustainability and local water management policies. The Northeast region of Brazil has in recent years experienced the worst drought in a century. As emergency measures, the state water agencies installed over 3,000 groundwater wells in urban and rural areas, increasing the communities’ reliance on groundwater. When the researchers conducted interviews with people in the region, however, they discovered that most community members didn’t understand that groundwater sources are limited and can dry up with overuse. They didn’t have a way to measure the water level of their wells and didn’t have information about best water management practices. The researchers hope that their inexpensive measuring tool will help people in the region improve conservation and water sustainability starting at the household level. The project also provided a valuable opportunity for the WSU students to get hands-on experience in building instrumentation with real-world applications, she added. The $223,182 project is funded by the U.K. Department for International Development and administered by the Evidence in Governance and Politics Metaketa III. The research is being conducted in collaboration with Alicia Cooperman, a Ph.D. candidate in political science at Columbia University and Brigitte Seim, assistant professor in public policy at the University of North Carolina, Chapel Hill.